A turkey crown provides the drama of bringing a whole bird to the table, but is much easier to handle. Turkey crowns have no joints to deal with, so all you get are long, easy-to-carve slices of white breast meat. This one is sold in its own roasting tin and comes ready-prepared with a pork, cranberry and orange stuffing and a prune and apple garnish - just add our flavoured butter to make it even more special. Preheat the oven to 190°C, gas mark 5. To make the butter, soften it in a small bowl with the lime zest and juice, plus the grated zest of the orange half and the lemon. Spread over the whole turkey crown. Cut the lemon, orange half and lime shell into quarters and place under and around the turkey along with the onion quarters. This will help to keep the turkey crown moist and add to the citrus flavour. Calculate the roasting time from the total weight of both the turkey and the stuffing (see Cooking time). 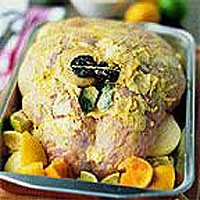 Cook the turkey uncovered in the preheated oven, basting every hour with the juices, until it is thoroughly cooked. Cover it with foil if the meat browns too much. To test the meat is cooked, insert a skewer into the thickest part of the breast and check to see if the juices run clear. Discard the onion and fruit, then transfer to a warm serving plate, wrap tightly with foil and rest for 30 minutes. The night before, prepare the turkey up to the end of Step 2, then completely cover with foil and chill in the fridge overnight. On Christmas morning, remove the foil and cook from Step 3.